Home | Latest News | Our Christmas Duos are Here to Make Your Holiday Shopping a Breeze! Our popular Christmas Duos are back and we’re positive these beauties will help you tick every loved one off your present list this holiday season! With a saving of 25% off our normal prices plus a complimentary cosmetic bag, you’ll love giving the gift of great skin! Our Nourish Duo is perfect for your mum/aunt/grandma to help them to continue to age gracefully. As the name suggests, these products love the skin and provide luxurious nourishment for dry or ageing skin. This powerhouse duo contains a Cleansing Milk with DMS 150ml and a DMS Base Cream High Classic Plus to strengthen and revitalise skin for a luminous glow. For your friend that is always on outdoor adventures, our Protect Duo will keep their environmental damage down to a minimum! This duo contains an SPF 50ml to protect and a DMS Mask with Vitamins 50ml to repair existing damage & prevent further oxidative stress. For the guys in your life, our Clear Duo is perfect as it contains our multi-tasking Total Cleansing Cream 150ml. This can be used as a shaving cream, face cleanser, body wash and even a shampoo! Accompanying this amazing do-it-all cleanser is the PlutioDerm Plus, which is an anti-inflammatory moisturiser, making it great to use post-shaving. 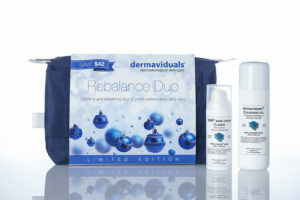 Our Rebalance Duo is perfect for the teens on your list. It is never too early to start looking after your skin and creating good habits. This duo contains our refreshing and calming Cleansing Gel 150ml and DMS Base Cream Classic 50ml to visibly restore & clarify skin, as well as prevent blemishes. 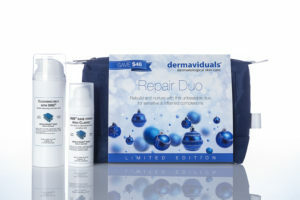 Our Repair Duo will rebuild and nurture skin for a healthy, even complexion. This duo is great for most skins, including sensitive and contains a Cleansing Milk with DMS 150ml and a DMS Base Cream High Classic. 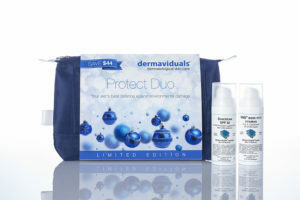 If you’re unsure which Christmas Duo would suit those on your list best, chat to your dermaviduals skin treatment therapist. They love skin (including talking about it!) and would love to help you choose the perfect gift. You can find your closest dermaviduals clinic here.